For the journal, see Gerontology (journal). Gerontology is the study of the social, cultural, psychological, cognitive, and biological aspects of ageing. The word was coined by Ilya Ilyich Mechnikov in 1903, from the Greek γέρων, geron, "old man" and -λογία, -logia, "study of". The field is distinguished from geriatrics, which is the branch of medicine that specializes in the treatment of existing disease in older adults. Gerontologists include researchers and practitioners in the fields of biology, nursing, medicine, criminology, dentistry, social work, physical and occupational therapy, psychology, psychiatry, sociology, economics, political science, architecture, geography, pharmacy, public health, housing, and anthropology. The multidisciplinary nature of gerontology means that there are a number of sub-fields which overlap with gerontology. There are policy issues, for example, involved in government planning and the operation of nursing homes, investigating the effects of an ageing population on society, and the design of residential spaces for older people that facilitate the development of a sense of place or home. Dr. Lawton, a behavioral psychologist at the Philadelphia Geriatric Center, was among the first to recognize the need for living spaces designed to accommodate the elderly, especially those with Alzheimer's disease. As an academic discipline the field is relatively new. The USC Leonard Davis School created the first PhD, master's and bachelor's degree programs in gerontology in 1975. While the number of aged humans, and the life expectancy, tended to increase in every century since the 14th, society tended to consider caring for an elderly relative as a family issue. It was not until the coming of the Industrial Revolution that ideas shifted in favor of a societal care-system. 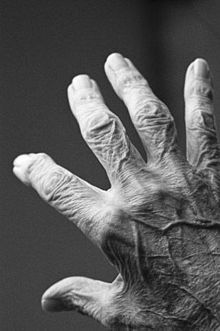 Some early pioneers, such as Michel Eugène Chevreul, who himself lived to be 102, believed that aging itself should be a science to be studied. Élie Metchnikoff coined the term "gerontology" c. 1903. Modern pioneers like James Birren began organizing gerontology as its own field in the 1940s, later being involved in starting a US government agency on aging – the National Institute on Aging – programs in gerontology at the University of Southern California and University of California, Los Angeles, and as past president of the Gerontological Society of America (founded in 1945). With the population of people over 60 years old expected to be some 22% of the world's population by 2050, assessment and treatment methods for age-related disease burden – the term geroscience emerged in the early 21st century. Biogerontology is the sub-field of gerontology concerned with the biological aging process, its evolutionary origins, and potential means to intervene in the process. It involves interdisciplinary research on biological aging's causes, effects, and mechanisms. Conservative biogerontologists such as Leonard Hayflick have predicted that the human life expectancy will peak at about 92 years old, while others such as James Vaupel have predicted that in industrialized countries, life expectancies will reach 100 for children born after the year 2000. and some surveyed biogerontologists have predicted life expectancies of two or more centuries. with Aubrey de Grey offering the "tentative timeframe" that with adequate funding of research to develop interventions in aging such as Strategies for Engineered Negligible Senescence, "we have a 50/50 chance of developing technology within about 25 to 30 years from now that will, under reasonable assumptions about the rate of subsequent improvements in that technology, allow us to stop people from dying of aging at any age", leading to life expectancies of 1,000 years. Biomedical gerontology, also known as experimental gerontology and life extension, is a sub-discipline of biogerontology that endeavors to slow, prevent, and even reverse aging in both humans and animals. Most "life extensionists" believe the human life span can be increased within the next century, if not sooner. Biogerontologists vary in the degree to which they focus on the study of the aging process as a means of mitigating the diseases of aging or extending lifespan, although most agree that extension of lifespan will necessarily flow from reductions in age-related disease and frailty, although some argue that maximum life span cannot be altered or that it is undesirable to try. Geroscience is a recently formulated interdisciplinary field that embraces biomedical gerontology as the center of preventing diseases of aging through science. In contrast with biogerontology, which aims to prevent age-related disease by intervening in aging processes, geriatrics is a field of medicine that studies the treatment of existing disease in aging people. There are numerous theories of aging, and no one theory has been accepted. There is a wide spectrum of the types of theories for the causes of aging with programmed theories on one extreme and error theories on the other. Regardless of the theory, a commonality is that as humans age, functions of the body decline. Stochastic theories of aging is the suggestion that aging is caused by small changes in the body over time and the body's failure to restore the system and mend the damages to the body. The cells and tissues are eventually injured due to the damage gathered over time. This causes the diminishes in an organ's function related to age. The notion of accumulated damage was first introduced by Weisman as the "wear and tear" theory. Accumulation theories of aging suggest that aging is bodily decline that results from an accumulation of elements, whether introduced to the body from the environment or resulting from cell metabolism. An example of an accumulation theory is the Free Radical Theory of Aging. Free radicals are reactive molecules produced by cellular and environmental processes, and can damage the elements of the cell such as the cell membrane and DNA and cause irreversible damage. The free-radical theory of aging proposes that this damage cumulatively degrades the biological function of cells and impacts the process of aging. The idea that free radicals are toxic agents was first proposed by Rebeca Gerschman and colleagues in 1945, but came to prominence in 1956, when Denham Harman proposed the free-radical theory of aging and even demonstrated that free radical reactions contribute to the degradation of biological systems. Oxidative damage of many types accumulate with age, such as oxidative stress that oxygen-free radicals, because the free radical theory of aging argues that aging results from the damage generated by reactive oxygen species (ROS). ROS are small, highly reactive, oxygen-containing molecules that can damage a complex of cellular components such as fat, proteins, or from DNA, they are naturally generated in small amounts during the body's metabolic reactions. These conditions become more common as humans grow older and include diseases related to aging, such as dementia, cancer and heart disease. The cross-linking theory proposes that advanced glycation end-products (stable bonds formed by the binding of glucose to proteins) and other aberrant cross-links accumulating in aging tissues is the cause of aging. The crosslinking of proteins disables their biological functions. The hardening of the connective tissue, kidney diseases, and enlargement of the heart are connected to the cross-linking of proteins. Crosslinking of DNA can induce replication errors, and this leads to deformed cells and increases the risk of cancer. The immunological theory of aging suggests that the immune system weakens as an organism ages. This makes the organism unable to fight infections and less able to destroy old and neoplastic cells. This leads to aging and will eventually lead to death. This theory of aging was developed by Ray Walford, an American gerontologist. According to Walford, incorrect immunological procedures are the cause of the process of aging. Several theories of aging are developed to observe the aging process of older adults in society as well as how these processes are interpreted by men and women as they age. Continuity theory is an elusive concept. On one hand, to exhibit continuity can mean to remain the same, to be uniform, homogeneous, unchanging, even humdrum. This static view of continuity is not very applicable to human aging. On the other hand, a dynamic view of continuity starts with the idea of a basic structure which persists over time, but it allows for a variety of changes to occur within the context provided by the basic structure. The basic structure is coherent: It has an orderly or logical relation of parts that is recognizably unique and that allows us to differentiate that structure from others. With the introduction of the concept of time, ideas such as direction, sequence, character development, and story line enter into the concept of continuity as it is applied to the evolution of a human being. In this theory, a dynamic concept of continuity is developed and applied to the issue of adaptation to normal aging. Environmental gerontology is a specialization within gerontology that seeks an understanding and interventions to optimize the relationship between aging persons and their physical and social environments. The field emerged in the 1930s during the first studies on behavioral and social gerontology. In the 1970s and 1980s, research confirmed the importance of the physical and social environment in understanding the aging population and improved the quality of life in old age. Studies of environmental gerontology indicate that older people prefer to age in their immediate environment, whereas spatial experience and place attachment are important for understanding the process. Some research indicates that the physical-social environment is related to the longevity and quality of life of the elderly. Precisely, the natural environment (such as natural therapeutic landscapes, therapeutic garden) contributes to active and healthy aging in the place. Jurisprudential gerontology (sometimes referred to as "geriatric jurisprudence") is a specialization within gerontology that looks into the ways laws and legal structures interact with the aging experience. The field started from legal scholars in the field of elder law, which found that looking into legal issues of older persons without a broader inter-disciplinary perspective does not provide the ideal legal outcome. Using theories such as therapeutic jurisprudence, jurisprudential scholars critically examined existing legal institutions (e.g. adult guardianship, end of life care, or nursing homes regulations) and showed how law should look more closely to the social and psychological aspects of its real-life operation. Other streams within jurisprudential gerontology also encouraged physicians and lawyers to try to improve their cooperation and better understand how laws and regulatory institutions affect health and well being of older persons. ^ Confluence. "Gerontology/Geriatrics Definitions". www.aghe.org. Retrieved 2016-11-25. ^ Hooyman, N.R. ; Kiyak, H.A. (2011). Social gerontology: A multidisciplinary perspective (9th ed.). Boston: Pearson Education. ISBN 978-0205763139. ^ Howell, Trevor H. (1987). "Avicenna and His Regimen of Old Age". Age and Ageing. 16 (1): 58–59. doi:10.1093/ageing/16.1.58. PMID 3551552. ^ Ammar, S (1998). "Vesalius" (PDF). Official Journal of the International Society for the History of Medicine. 4: 48. ^ "Ibn al-Jazzār, Abū Ja'far Ahmad ibn Ibrāhīm ibn Abī Khālid (d. 979/369)". Islamic Medical Manuscripts. U.S. National Library of Medicine. Retrieved 24 September 2013. ^ "Specialized literature". Islamic culture and medical arts. U.S. National Library of Medicine. Retrieved 24 September 2013. ^ "About the National Institute on Aging". National Institute on Aging, US National Institutes of Health. 2018. Retrieved 5 March 2018. ^ Newcomb, Beth (15 January 2016). "In memoriam: James E. Birren, 97". University of Southern California - News. Retrieved 5 March 2018. ^ Burch, J. B; Augustine, A. D; Frieden, L. A; Hadley, E; Howcroft, T. K; Johnson, R; Khalsa, P. S; Kohanski, R. A; Li, X. L; MacChiarini, F; Niederehe, G; Oh, Y. S; Pawlyk, A. C; Rodriguez, H; Rowland, J. H; Shen, G. L; Sierra, F; Wise, B. C (2014). "Advances in Geroscience: Impact on Healthspan and Chronic Disease". The Journals of Gerontology Series A: Biological Sciences and Medical Sciences. 69 (Suppl 1): S1–S3. doi:10.1093/gerona/glu041. PMC 4036419. PMID 24833579. ^ Seals, D. R; Justice, J. N; Larocca, T. J (2015). "Physiological geroscience: Targeting function to increase healthspan and achieve optimal longevity". The Journal of Physiology. 594 (8): 2001–2024. doi:10.1113/jphysiol.2014.282665. PMC 4933122. PMID 25639909. ^ Kohanski, R. A; Deeks, S. G; Gravekamp, C; Halter, J. B; High, K; Hurria, A; Fuldner, R; Green, P; Huebner, R; MacChiarini, F; Sierra, F (2016). "Reverse geroscience: How does exposure to early diseases accelerate the age-related decline in health?". Annals of the New York Academy of Sciences. 1386 (1): 30–44. Bibcode:2016NYASA1386...30K. doi:10.1111/nyas.13297. PMID 27907230. ^ a b c d Carrie A. Werner (2010). "The Older Population: 2010" (PDF). 2010 Census Briefs. U.S. Census Bureau. C2010BR-09. ^ a b c d e Taylor, Albert W.; Johnson, Michel J. (2008). Physiology of Exercise and Healthy Aging. Human Kinetics. ISBN 978-0-7360-5838-4. ^ "Population". 2008 Older Americans : Key indicators of Well-Being. 2008. ^ "Institute for Geriatric Social Work". Boston University. Archived from the original on 2010-07-11. ^ "Geriatric Social Work Initiative". ^ Watts G (June 2011). "Leonard Hayflick and the limits of ageing". Lancet. 377 (9783): 2075. doi:10.1016/S0140-6736(11)60908-2. PMID 21684371. ^ Christensen, L; Doblhammer, K; Rau, G; Vaupel, JW (2009). "Ageing populations: the challenges ahead". Lancet. 374 (9696): 1196–1208. doi:10.1016/s0140-6736(09)61460-4. PMC 2810516. PMID 19801098. ^ Richel, Theo (December 2003). "Will human life expectancy quadruple in the next hundred years? Sixty gerontologists say public debate on life extension is necessary". J Anti-Aging Med. 6 (4): 309–314. doi:10.1089/109454503323028902. PMID 15142432. ^ de Grey, Aubrey D. N. J.; Rae, Michael (October 14, 2008). Ending Aging. St. Martin's Griffin. p. 15. ISBN 978-0312367077. ^ Lithgow, Gordon J. (1 September 2013). "Origins of Geroscience". Public Policy & Aging Report. 4 (1): 10–11. doi:10.1093/ppar/23.4.10. ^ a b Lipsky, Martin S.; King, Mitch (2015). "Biological theories of aging". Disease-a-Month. 61 (11): 460–466. doi:10.1016/j.disamonth.2015.09.005. PMID 26490576. Retrieved 4 April 2018. ^ a b Boniewska-Bernacka, Ewa (2016). "Selected Theories of Ageing" (PDF). Higher School's Pulse. 10: 36–39. ^ Harman, D (November 1981). "The aging process". Proc. Natl. Acad. Sci. U.S.A. 78 (11): 7124–7128. Bibcode:1981PNAS...78.7124H. doi:10.1073/pnas.78.11.7124. PMC 349208. PMID 6947277. ^ Hagen, Bruce N; MK Shigenaga; TM Hagen (September 1993). "Oxidants, antioxidants, and the degenerative diseases of aging". Proc. Natl. Acad. Sci. U.S.A. 90 (17): 7915–7922. Bibcode:1993PNAS...90.7915A. doi:10.1073/pnas.90.17.7915. PMC 47258. PMID 8367443. ^ Beckman, KB; Ames BN (April 1998). "The free radial theory of aging matures". Physiol Rev. 78 (2): 547–581. doi:10.1152/physrev.1998.78.2.547. PMID 9562038. ^ Failla, G (30 September 1958). "The aging process and cancerogenesis". Annals of the New York Academy of Sciences. 71 (6): 1124–1140. Bibcode:1958NYASA..71.1124F. doi:10.1111/j.1749-6632.1958.tb46828.x. PMID 13583876. ^ Szilard, Leo (January 1959). "On the nature of the aging process". Proc. Natl. Acad. Sci. U.S.A. 45 (1): 30–45. Bibcode:1959PNAS...45...30S. doi:10.1073/pnas.45.1.30. PMC 222509. PMID 16590351. ^ Freitas, AA; de Magalhaes, JP (Jul–Oct 2011). "A review and appraisal of the DNA damage theory of ageing". Mutat Res. 728 (1–2): 12–22. doi:10.1016/j.mrrev.2011.05.001. PMID 21600302. ^ Horvath S (2013). "DNA methylation age of human tissues and cell types". Genome Biology. 14 (10): R115. doi:10.1186/gb-2013-14-10-r115. PMC 4015143. PMID 24138928. ^ a b c d e f Phillipson, C.; Baars, J. (2007). "Ch. 4: Social theory and social ageing". In Bond, J.; Peace, S. M.; Dittmann-Kohli, F.; Westerhof, G. (eds.). Ageing in Society (3rd ed.). SAGE. pp. 68–84. ISBN 978-1-4129-0020-1. ^ Blalock, H.M. (1982). Conceptualization and measurement in the social sciences. Beverly Hills: Sage. ISBN 978-0803918047. ^ Hage, J. (1972). Techniques and problems of theory construction in sociology. New York: Wiley Interscience. ISBN 978-0471338604. ^ Kaplan, Abraham (1964). The Conduct of Inquiry: Methodology for Behavioral Science. Transaction Publishers. ISBN 978-0-7658-0448-8. ^ Rowe, J.W. ; Kahn, R.L. (1998). Successful aging. New York: Pantheon. ISBN 978-0375400452. Webster, N. (2003). Webster's new American dictionary. New York: HarperCollins. ^ Dannefer D (November 2003). "Cumulative advantage/disadvantage and the life course: cross-fertilizing age and social science theory". J Gerontol B Psychol Sci Soc Sci. 58 (6): S327–37. doi:10.1093/geronb/58.6.S327. PMID 14614120. ^ Sanchez-Gonzalez, D.; Rodriguez-Rodriguez, V. (2016). Environmental Gerontology in Europe and Latin America. Policies and perspectives on environment and aging. New York: Springer Publishing Company. p. 284. ISBN 978-3-319-21418-4. ^ Rowles, Graham D.; Bernard, Miriam (2013). Environmental Gerontology: Making Meaningful Places in Old Age. New York: Springer Publishing Company. p. 320. ISBN 978-0826108135. ^ Scheidt, Rick J.; Schwarz, Benyamin (2013). Environmental Gerontology. What Now?. New York: Routledge. p. 338. ISBN 978-0-415-62616-3. ^ Wahl, H-W.; Scheidt, R.J.; Windley, P.G. (2004). Annual Review of Gerontology and Geriatrics. Focus on Aging context: Socio-Physical Environments. New York: Springer Publishing Company. p. 384. ISBN 978-0826117342. ^ Andrews, GJ. ; Phillips, DR. (2005). Ageing and Place: Perspectives, Policy, Practice. London: Routledge. p. 272. ISBN 978-0415481656. ^ Sanchez-Gonzalez, D (2015). "Physical-social environments and aging population from environmental gerontology and geography. Socio-spatial implications in Latin America". Revista de Geografía Norte Grande. 60 (60): 97–114. doi:10.4067/S0718-34022015000100006. ^ Sanchez-Gonzalez, D.; Adame-Rivera, LM. ; Rodriguez-Rodriguez, V. (2018). "Natural landscape and healthy ageing in place: The case of the Cumbres of Monterrey National Park in Mexico". Boletin de la Asociacion de Geografos Espanoles. 76 (76): 20–51. doi:10.21138/bage.2514. hdl:10261/163106. ^ Kapp, Marshall B. (1996). "Therapeutic Jurisprudence and End-of-Life Medical Care: Physician Perceptions of a Statute's Impact Medical Law 15 Medicine and Law 1996". Medicine and Law. 15 (2): 201–17. PMID 8908972. Retrieved 2018-03-20. ^ Doron, Israel; Meenan, Helen (2012). "Time for Geriatric Jurisprudence". Gerontology. 58 (3): 193–6. doi:10.1159/000335324. ISSN 0304-324X. PMID 22538767.